Ocean Energy's ability to create electricity from seawater may prove to be the most efficient and eco-friendly way to bring edge computing to coastal population centers. Offshore, underwater data centers are going to be powered using wave motion, says a sustainable energy developer. And it's going to happen soon. Commercial wave energy company Ocean Energy says it’s almost completed a marine hydrokinetic wave generator build and that the 1.25 Megawatt power-production capacity vessel will be ready to deploy in 2019. The 125-feet-long wave converter OE Buoy will provide enough electricity for a subsea data center platform, the company claims. Shipbuilder Vigor has been constructing the water generator in its Portland, Oregon, yard. When it’s complete, the 826-ton vessel will be towed to the U.S. Navy’s Wave Energy Test Site in Hawaii and be used in a grid-scale project. However, Ocean Energy says the device is fully scalable and could be used in offshore fish farming or aquaculture, powering underwater naval vehicles en masse, energizing remote island communities, and powering marine-based data centers. Microsoft recently deployed an unrelated, sunken, data center off Scotland. That shipping-container-sized server room was submerged 112 feet below the surface and may be a harbinger of things to come. Advantages of water-based, off-shore data center-locating include no rent — there’s no landlord in open waters — and proximity to expensive real-estate population centers — most of the world’s population lives near a coast. There are edge computing benefits to that. One being that processing data where data is being generated rather than at a central, traditional location is better for latency reasons. And in a future expected to be filled with Internet of Things (IoT) technology, such as robots, we will need lower latencies than has been traditionally available. Edge computing provides that. Eco-benefits to placing water-driven data centers in the sea include reduced carbon dioxide emissions (Ocean Energy claims each generator could reduce CO2 by 3,600 tons per year), and the aforementioned free cooling and copious computing power— data electricity use of one kind or another, including data centers, will vacuum up 20 percent of global energy soon, some say. OE Buoy works using technology called the Oscillating Water Column where wave motion forcing air up, and pulling air down, builds a vacuum of air. That then turns a turbine. An umbilical link can bring the electricity to shore, or it can remain at sea and be used in the data center or aquatic installation of one kind or another. There’s only one principal moving part, the inventors say, which aids reliability, and live sea trials have been run successfully over a three-year period in the rough Atlantic, off Ireland. Good mooring is the key to the survivability — the devices are inaccessible for long periods. “This first-of-its kind wave energy convertor is scalable, reliable and capable of generating sustainable power to facilitate a range of use-cases that were previously unimaginable or just impractical,” McCarthy says. 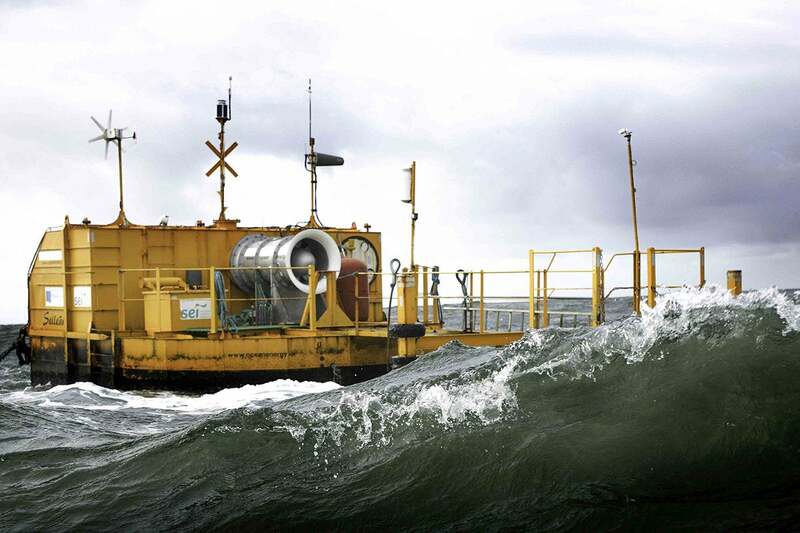 “Sustainable power from waves,” as the Irish- and U.S.-government-supported private company calls it.